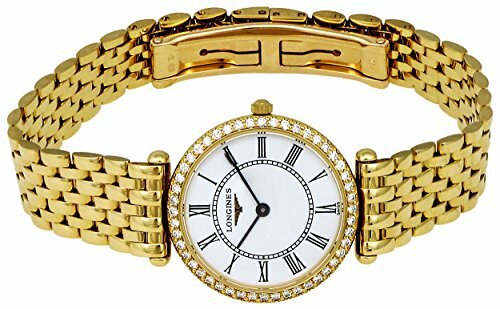 This beautiful Longines 18k Gold & Diamond La Grande Classique model # L4.191.7.11.6 / L41917116 will make a perfect gift or a great addition to your collection. Designed with enduring materials and fashionable designs presenting the Ladies' prestigious La Grande Classique de Longines. Made for the contemporary woman who loves luxury in simple fashions, this beautiful timepiece features a lovely white face with long black hands and sophisticated black Roman Numeral markers. The 18k Solid Gold case is accented by a collection of diamonds framing the face. Longines is well-known for their excellent tastes in diamonds, and these 48 dazzling beauties are no different. All .48 carats worth feature a purity level of VVS, and a Top Wesselton color. Not only for their diamonds, but Longines is also renown for their Sapphire crystals. Durable, they are virtually unbreakable, and are polished by master polishers. 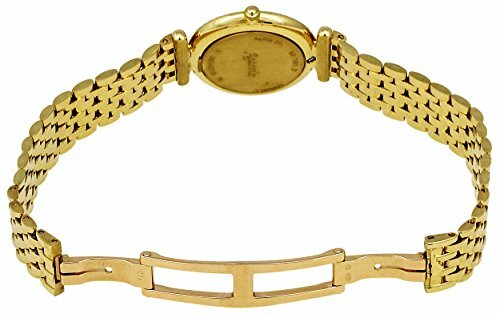 Presented by an elegant 18k Gold bracelet. Features precise ETA E03.001 Swiss quartz movement for precise accuracy. Water Resistant to 30 meters / 100 feet.